I have mixed feelings about Sundays. On the one hand, it's still the weekend! On the other hand, there's the prospect of work in the morning. When I was bigger I used to wear the same kind of outfit to work every day. Baggy black trousers, a loose fitting top of some sort and flat black pumps. It was non descript, it was dull but, most importantly for me at the time, it hid a multitude of sins. Or at least, I thought it did. In reality wearing that probably made me look even bigger than I was. These days I do make an effort with what I wear to work. It's still generally a variation on a theme (pencil skirt, nice top, coloured cardigan) but I never wear the same outfit twice in a week. I work in an office environment, in the legal profession, so I can't be too avant-garde with my clothes, but I do try and wear quirky jewellery and brightly coloured heels, to look a bit different. 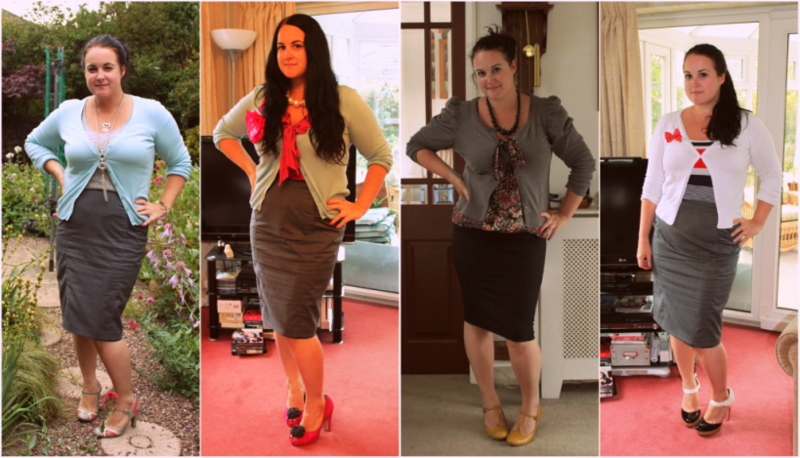 The four outfits pictured here are what I wore to work last week (we have dress down day every Friday so I'm only in office mode for four days a week) and they're fairly typical of what I wear each day. What do you wear to work? Are you lucky to work somewhere where 'office' clothes aren't necessary? Or are your employers even stricter than mine about dress code?